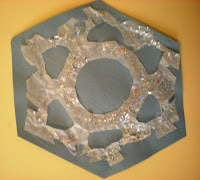 Our one Pre-K teacher made some beautiful snowflakes I would like to share with you. She gave each child some tissue paper that they folded over and over, then she let them cut away. The only stipulation was to make sure that they didn't cut the fold entirely. The layers of tissue paper are pretty easy to cut. 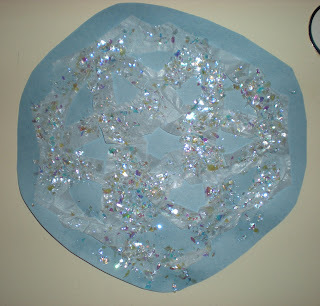 The snowflakes are really beautiful when they are done, the children did such a great job and made some beautiful creations. 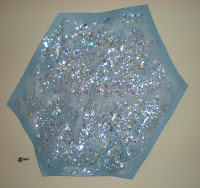 The snowflakes were then glued down to the light blue construction paper for a backing. 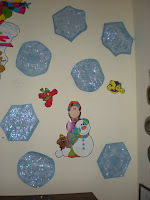 She then had a glue/water mixture that the children could paint over top of the snowflake. She added water to the glue so that they could paint it easier without tearing the tissue paper. Finally she had gotten some "snow glitter" at our local craft store. 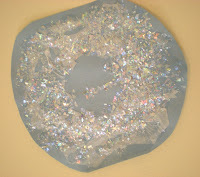 It is not a coarse type glitter, it is more like a cellophane type glitter. The children sprinkled the glitter on their snowflakes. When they dried they were ready to decorate our room. They add quite a sparkle.